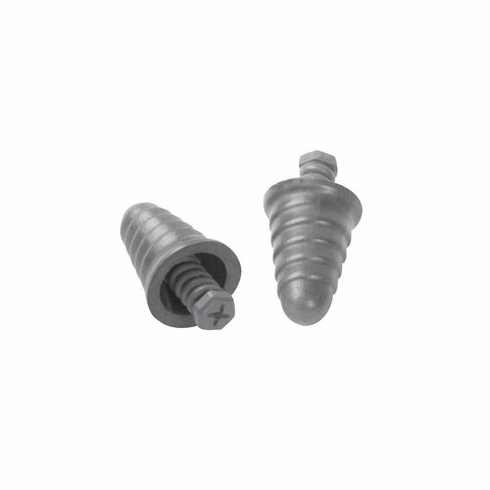 3M™ Peltor P1300 Skull Screws Ear Plugs, Cordless3M™, Skull Screws Ear Plugs, Cordless, Item # P1300, The tough look also comes with a tough NRR 30dB protection. Skull Screws are not your ordinary earplugs. Their unique, steely gray finish makes them look tough as nails, but they're actually made of ultra-soft foam that offers all day comfort. The convenience of a no-roll down plug is further advanced with the addition of screw "threads" that are molded into the foam. Twisting the plug during insertion helps achieve an optimum noise seal. The design is also more hygienic because you never have to touch the foam with your fingers. The tough look also comes with a tough NRR 30dB protection.